I thought it was important for as many potential builders and Yagi users to see this as possible so with permission of DUBUS, the who article on the subject of low noise Yagis has been replublished here. 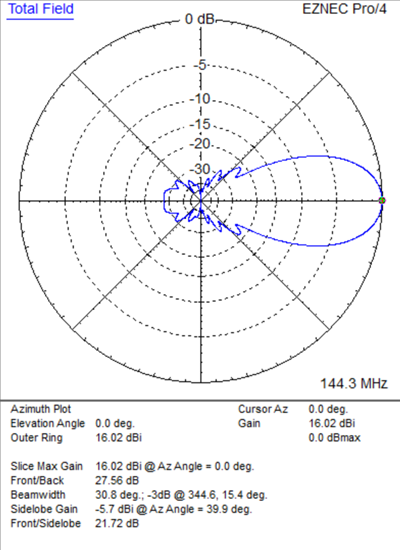 Within this article we will discuss one common misconception relating to Yagi antennas and what makes them ‘low noise’. One common use of the term low noise is in describing low temperature Yagis. Low temperature Yagis are beneficial for those looking toward weak signal applications such as EME and MS on upper VHF, UHF and up frequency ranges. However, Low noise Yagis and their associated benefits do not start there and I will attempt to explain and demonstrate how low noise Yagis are designed, used and benefited from on lower frequencies including some of the upper HF bands. While I have presented these fact before, some have misinterpreted what I have referred to in respect of low noise Yagi designs and how they would benefit the user. One good example can be found HERE on the DK7ZB website. I have selected the individual statements from this page and provided a statement on why I believe these statements are not wholly accurate or perhaps not clearly enough written by Martin. Before moving on I need to reiterate that this is not necessarily Martin’s view, others have also interpreted incorrectly. However, Martin’s is publically displayed so a good place to start any correction statements. ‘’VE7BQH writes about 50-MHz-Yagis: Very low side lobes and F/R on this band produce no specific improvement in G/T based on pure sky noise and ground noise. Assuming reasonable side lobes, F/R and good VSWR bandwidth, Gain is the most critical parameter on 6M. It is this part of the statement that could be easily missed or not noted as being important and is fundamental in ensuring best all-round performance on 50MHz. The part of the statement relating to G/T is true. However, it does need some explaining in order to provide the reasons this is miss-leading for the everyday-ham to be used as a part of a 50MHz antenna selection process. First of all, G/T or Gain over Temperature is a mean opinion score calculated by placing the antennas gain figure over the antennas temperature figure (or noise figure). The resulting G/T figures is a measurement used to determine an antennas ability to receive weak signals for purposes such as EME, MS and so on. Pure Sky and ground noise are such at 50MHz that the temperature or overall G/T has no bearing on a Yagi’s performance from a reception perspective. However, the fact remains that most hams live in suburbia with noise levels of many S points (way above levels measured for G/T purposes) meaning any weak signals or potential DX that could be worked is generally covered by a high man-made noise floor. G/T will make no difference to these signals but a carefully modelled Yagi WILL reduce these ambient noise levels and in some cases by many S points. This will result in a station using such Yagi being able to hear and work weak stations they would not otherwise be able to hear. 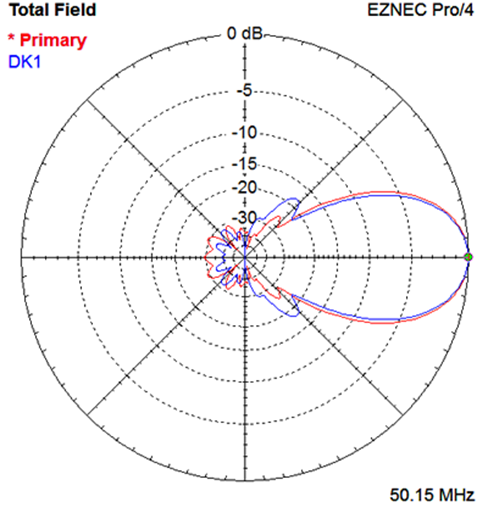 What is not made clear in DK7ZB’s original statement is that as a part of the design process, optimisation for minimal side lobes and F/R (or what I like to call the ‘rear bubble’) plays a role in establishing a better G/T figure and/or a quieter Yagi but this is not the only factor. Additionally, these factors change band to band and what applies on 2m and 70cms (such as G/T and sky temperature) may have absolutely no bearing on receive performance on the 6m band. As discussed above, G/T applies to upper VHF and up antennas but is only just coming into play on the 2m band (and is very important at 432Mhz and up). On these bands careful optimisation is again needed but the performance parameters and the way the design is addressed should be completely different on 2m and 70cms to the design parameters on 6m. Simply scaling and re-optimising will NOT yield the best results on each band, one-size does not fit all when looking at Yagis for VHF and UHF frequencies. Let us now take a look at what DOES constitutes a low noise Yagi for bands such as 4m, 6m and upper HF. As a Yagi increases in length, side-lobes appear either side of the main, desired lobe. 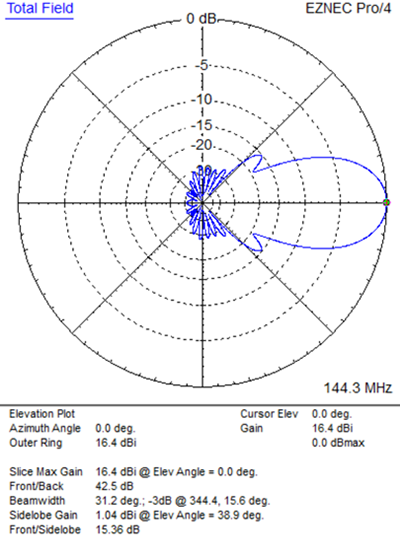 These side-lobes are present in the Azimuth plane (looking down on the antenna from above, the way we mostly look at Yagi pattern) and the Elevation plane too (looking at the antenna from the side) and it is this elevation pattern which is the biggest issue and main reason for noise pick-up in urban environments and therefore needs to be addressed if the best user experience is to be seen. 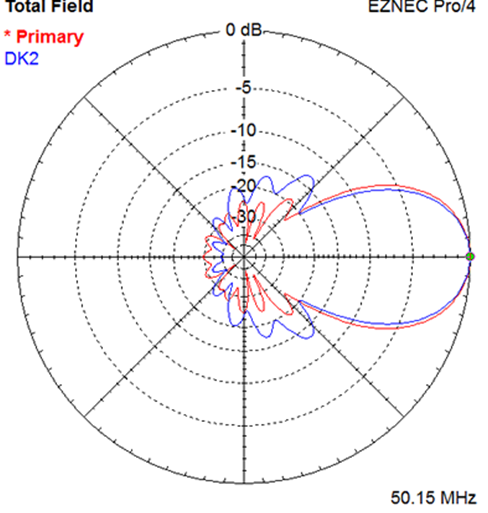 Take a look at the plots below which compare a 9 element G0KSC LFA with a 9 element DK7ZB for 50Mhz. 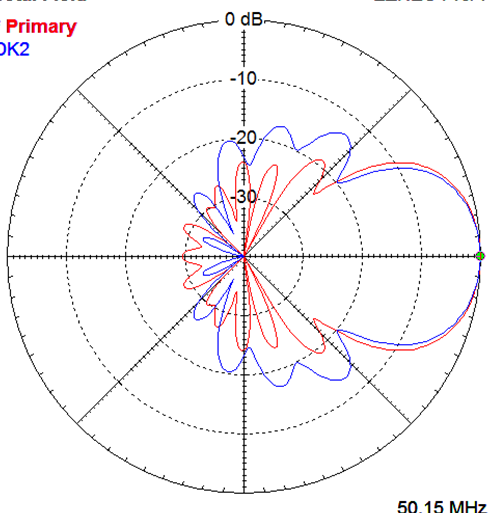 Let us first take a look at fig1 which presents an over-lay of a G0KSC 9 element LFA and a DK7ZB 9 element split-dipole Yagi. Presented gain for both antennas is exactly the same at 14.48dBi. F/B on the DK7ZB is 39.17dB while on the G0KSC LFA 9, F/B (Front to Back Ratio) is just 29.57dB so the DK7ZB has the same gain, much better F/B and 1m shorter than the G0KSC LFA 9, the DK7ZB must be better right? We will come back to this point in just a moment. First, let us take a look at the elevation plot. Fig2 shows the elevation plots for both antennas, once again overlaid with the field strength of the antenna and pattern from the side. From this plot we can see (or the trained eye can!) that the DK7ZB Yagi has been computer optimised but side-lobe suppression control has been applied to the azimuth plane only during the optimisation process. This is clear because the elevation plane pattern has ‘blown’, the elevation lobes are of significant size. When optimising a Yagi, if side-lobe control is applied to the azimuth plane, lobes both up and down can extend uncontrollably as is the case on the DK7ZB Yagi elevation plot. If side-lobe control is applied to the elevation plane, the azimuth lobes are controlled at the same time, this ‘blown’ pattern effect does not happen when side-lobe control during the optimisation process is handled in the elevation plane, so what does this mean in the real world? Imagine the horizontal centre-line in the middle of fig2 being ground-level and absolute center of the plot being your house/shack or tower. The blue and red lines represent the field strength in any respective direction from both the G0KSC LFA 9 and the DK7ZB 9. The largest up and down-facing lobes on the DK7ZB are only 13dB down on the most forward-facing and desired lobe. This means any signal coming towards the antennas frontal, main lobe at the same field strength as any signal from below the antenna at the same angle as the largest side-lobe will both be received just 2S points down on anything coming in from the front! Some might say that the down-facing lobes are not there when the ground is present, they are reflected away. Again, this is not quite correct. While reflection does occur, the field strength remains in the positions of the free space Yagi along with any respective ‘gain’ these would produce when receiving. The G0KSC LFA 9 is down at this same point 19dB, this equates to 3S points. If in a particular direction your noise floor is 3 S points on the DK7ZB antenna caused by a noise source coming in at that angle, on the G0KSC antenna noise will be 1S point or more lower (what if that rare DX was just over S2?). Very deep nulls are present from this first side-lobe backwards on the G0KSC LFA 9 between the remaining heavily suppressed elevation lobes and it is this high-level suppression which drastically reduces noise pick-up from below the antenna and also the reason the outright F/B (front to back ratio) on the G0KSC antenna has been reduced. This reduction is a deliberate sacrifices (in F/B) to ensure maximum suppression from below the antenna occurs to help reduce noise from all sorts of day to day noise generators such as Plasma TV’s, DSL Modems, Alarm systems, WiFi routers and so on. The same Scenario occurs within the azimuth plane too with noise being drastically reduced outside of the main lobe which results in any unwanted forward-facing noise either side of the desired lobe being greatly reduced. Application examples and real-world experiences are always good when looking to cover and explain complex subjects such as this and I will use one provided from Peter G8BCG who installed an 8el LFA Yagi to compare with a M2 JHV antenna, the JHV having been designed using similar principles to the DK7ZB antenna. Like others, Peter was a sceptic of the LFA and the in-built noise reduction properties of the antenna was said to have. Having the luxury of 2 x 60’ tilt and wide-up towers, Peter installed an LFA alongside is existing 6m Yagi to compare. Peter managed to work a station in Mongolia on 50MHz that he could hear on the G0KSC LFA but could not hear on the JHV. There was no noise from beneath either antenna as both were located in a field in the countryside. However, there were power lines in the distance and it proved to be power-line noise being received on the JHV that was the problem which was not present on the G0KSC LFA. Pattern is not the only method of reducing noise on a Yagi (although it can play a major role in reducing noise if optimisation is conducted in the right way). One commonly known issue is a result of static build-up within the driven element. Additionally, the broad-banded nature of split dipoles means that although directional properties disappear quickly when you move away from the design frequency of a Yagi, omni-directional receptive properties remain for many MHz either side of the desired band segment. With an LFA (Loop Fed Array) loop or folded dipole fed Yagi (and as employed on my OWL (Optimised Wideband Low Impedance Yagis) the side of the loop opposite the feed point can be directly connected to ground. At the design frequency, this point of contact is one of zero current so is ‘not seen’ and has no detrimental impact on performance. It provides a DC ground to the driven element which allows both a static drain and a protection mechanism for the transceiver against natural occurrences such as lightning strikes. One very useful and additional noise reducing property is the band-pass filter effect this arrangement provides. Unlike the split-dipole Yagi, the grounded loop feed arrangement becomes very high impedance quickly either side of the design frequency. This means you are less susceptible to receiving unwanted out-of-band noise/interference. 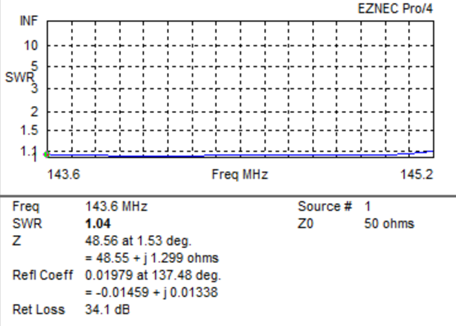 Combined with a carefully considered computer optimisation exercise, A Yagi for modern-day environments and requirements can be produced which is resistive to modern-day man-made noise generators. To this end, I will provide two examples of noise reduction comparisons, one on the 6m band, the other on 28MHz! Both independently produced and are 2 of many now place on Youtube and other Internet websites. This is on top of the many hundreds of confirmation Emails received by very happy users of low-noise Yagi antennas. https://www.youtube.com/watch?v=WcFib4PV_RA - 6m comparison between 7el 50MHz WOS LFA and M2 7el JHV by VA3NCD - noise level change is significant. Lower gain LFA is louder on received signals due to reduced noise levels. What Martin refers to here is that split-dipole Yagis with a feed impedance lower than 50Ω are generally better performers all round if modelled correctly. This statement cannot be extended to generalise Yagis as a whole. Yagis using folded dipoles, LFA loops or bent elements (such as UA9TC, DG7YBN designs and others) are all Yagis which would have a lower impedance if more traditional driven and parasitic elements where used but have been cleverly adapted in order that a 50Ω impedance is seen without having to add third-party matching devices after the design. In so doing, all potential losses and structure impacts on pattern are seen and predicted at the software model stage, there are no surprises once built! However small this loss may or may not be, there is no method of transforming anything known to science that is 100% efficient and by modelling a ‘self-matched’ Yagi with all aspects considered, a much closer representation of the end result can be achieved and summarised. As a foot note, some of these steps forward in self-matching Yagis have led to more than just presentation of a 50Ω feed impedance as in some instances, marked differences have been seen in pattern too. As with certain longer LFA models, the re-shaping of certain elements leads to a much tighter, cleaner and quieter pattern than without. Some good examples can be found on the DG7YBN website where the GTV antennas employ bent driven elements to transform a lower impedance Yagi to one of 50Ω. 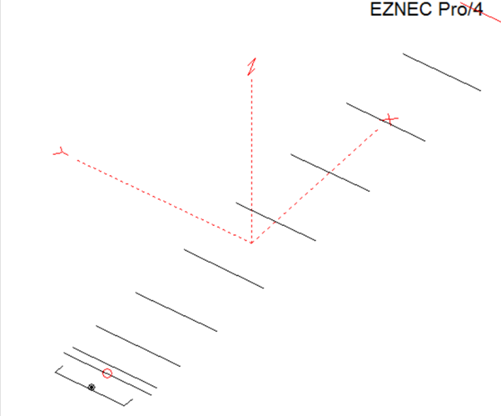 In order to demonstrate the enhancements that can be seen from the addition of bent elements, below are two Azimuth plots for the YU7EF EF0213M6. The first marked ‘std’ is the default YU7EF Yagi using all straight elements. The second is the same antenna with no other adjustments other than a UA9TC single reflector replaces the straight one in the original antenna. Note that no other adjustments have been made at all yet the suppression to the rear of the Yagi has improved dramatically over the standard antenna (in the order of 10dB F/B) and a small improvement in gain is also seen. As no adjustment of any other part of the antenna has been made, and due to the fact that the UA9TC reflector increases feed point impedance, the SWR curve of this antenna remains flat but now at around 1.5:1 across the band from 144MHz to 145MHz. Optimisation of the antenna (including reduction of the feed point impedance to 50Ω should result in further improvements to the antennas performance including higher levels suppression and gain as a result of the impedance drop. 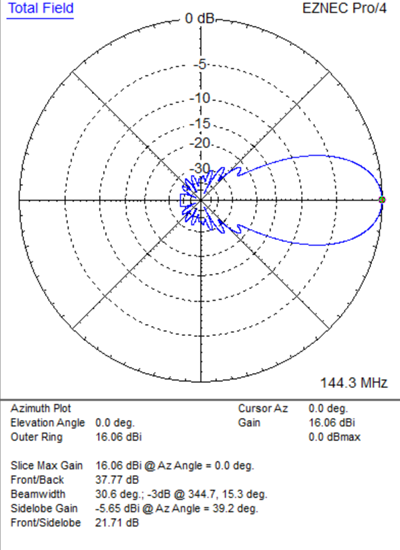 To demonstrate the results that can be obtained when using a computer optimisation program along with the UA9TC reflector, I present below a 14 element Yagi having been computer optimised with the UA9TC reflector in place. Control has been given to the computer to adjust the width of the reflector and the length of the forward-facing sections too which can see seen in the element layout illustration below. Substantial increases in F/R have been seen as a result of optimisation with this reflector in addition to a very flat and exceptionally wide SWR being achieved too. It is not just the azimuth plot which shows excellent suppression, the elevation plot is as impressive if not more so. While the first (and only) forward-facing lobe in both plots may appear to be pronounced, it is in fact a result of the rear-bubble being so drastically reduced over what would be considered usual. 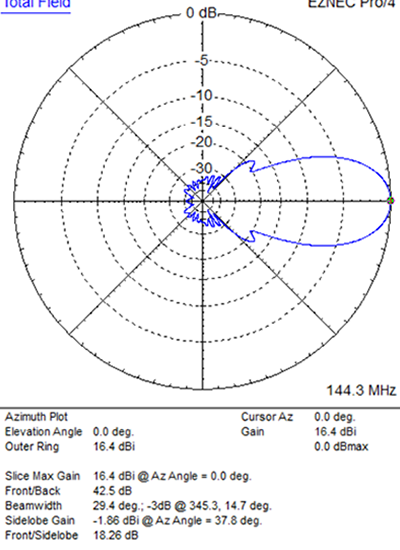 Above: Elevation plot of the 14 element G0KSC ‘TC’ Yagi using the UA9TC style reflector. Second image, the same antenna element layout showing the reflector, its shape and position. A low noise Yagi is not something limited to those users of upper VHF and UHF bands and benefits can clearly be seen within noisy environments when a Yagi is optimised in a certain way. Benefits associated with Elevation plane optimisation can be seen at HF frequencies as well as VHF frequencies as a result of the improved signal to noise characteristics of a Yagi optimised in the way we have discussed. Certainly, gain is not the most important parameter in modern-day, suburban environments. In these cases, Signal to Noise ratio remains the most important aspect within a Yagi in these environments, at least it is if we want to hear as well as be heard! New and exciting techniques to model and optimise Yagis for low noise and super-clean patterns include the ability to optimise without having to use any form of matching methods outside of those already optimised as a part of the antenna itself and as time goes on and more experimenters and modellers adopt these methods, I am sure further enhancements and development will result. In a future article to appear in DUBUS I will be drilling down into the UA9TC style reflector and other new ‘bent element’ methods of Yagi enhancement and how the type of arrangement chosen, may influence the point at which ‘optimum’ (boom length) balanced performance can be achieved.